(Victor Valley)– Valiant entertainment, for those that don’t know, is the publishing juggernaut that has brought the world X-O Manowar, Bloodshot, Ninjak and more. If you are thinking, “yeah, they were cool… In the 90’s…” Then you clearly have been sleeping under a rock the last decade. Their newest storyline that falls across their library of books is the Book of Death and it starts with this. The book centers around one of the immortal brothers in the Valiant Universe, the Eternal Warrior. His role throughout the ages is to protect the Geomancer, a mystic role passed down throughout the ages and grants a being powers connected directly to the Earth. 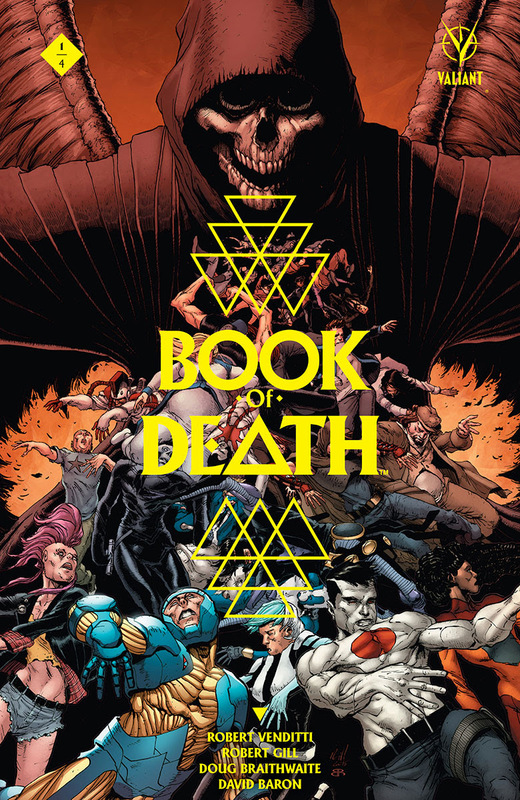 A young Geomancer has came from the future and with her, a book only she can read that tells the stories of how Valiant’s brightest heroes die, the Book of Death. With this knowledge, she is wanted on all sides, and only the Eternal Warrior can protect her. But there’s an evil stirring as well, an evil that wants this young Geomancer gone. The book is a bloody first look into what promises to be an eye opening event. From the first splash page, which shows a whole town impaled by trees, you know this isn’t going to be for the faint of heart. Writer Robert Venditti crafts the beginning of the end, literally, and leaves the issue with a great cliffhanger. Not only do we see the Eternal Warrior, we see all the heroes we know and love: X-O Manowar, Ninjak, Bloodshot, and more. Artists Robert Gill and Doug Braithwaite are the perfect fit for this series, as their artwork evokes the danger at every turn that we see in this book. This is the beginning to an epic storyline, and this issue is just that: epic. Valiant has been on a roll since coming back a few years ago, and the Book of Death continues the success. This is literally the beginning to the end, and the end never looked so good. A great first issue for not just the miniseries, but for the whole Book of Death event, which continues with one shots featuring the foretold end of Valiant’s bravest. I have to give the Book of Death #1 a perfect @@@@@ out of FIVE. The end never looked so great.